I don’t often specifically mention my company when I blog, but we’re looking for a developer. Short description: “VB 2005, SQL 2005, RFID”. Slightly longer description here. For even more info, please contact me directly — I get copied on messages sent to the e-mail alias on the job posting. If you or someone you know is interested, please let me know. All in all, WLW makes it much more enjoyable to post. Since I started using it I’ve posted more. I still may go a while between posts, but when I post one, it is so easy that I usually end up posting a couple more within a short amount of time. For example, this is my third post in about 20 minutes. Anyway, I recommend you download and try it. It works with lots of popular blogging engines. * = When I first type “Windows Live Writer”, I misspelled it and typed “Windows Lice Writer” For some reason I thought that was funny enough to mention here. Maybe it’s my level of sleepiness? I spoke briefly about my haircut schedule here. I think I was already at week 7 or 8 then, so that would put me somewhere around week 12 or so now. I tried to get it cut today, but the wait was longer than my schedule would allow. Oh well, maybe next week. Lately I’ve been tired. Extremely tired. There are many factors contributing to my tiredness, such as work, um, yeah, I guess that’s the big one. As I was typing this sentence I actually sat here for 30 seconds trying to think of what else could be making me tired aside from how much I’ve been working. I guess there are other things, like poor sleep quality when I do sleep, my eating habits, my lack of exercise, etc., but work is the big one wearing me out right now. I was talking to the guys at the office about it and to illustrate my point I drew a graph on the whiteboard. I’ve decided to replicate that here as well. I don’t know why, really — probably because I haven’t posted in a while and I figured that this was as good a topic as anything else I could come up with. 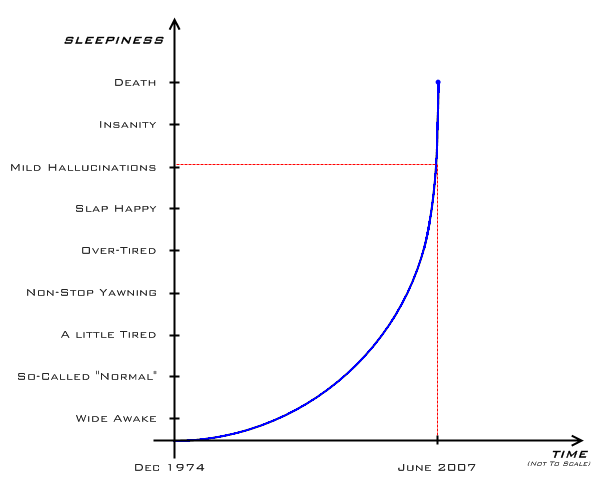 Anyway, as you can see from my very (non)scientific graph to the right (click for larger version), somewhere around the end of May or beginning of June I became tired enough to experience mild hallucinations. OK, not really, but I have been noticing problems reading recently — I think I’ve read a certain word in a sentence/paragraph, and it just really doesn’t make any sense. It’s not until I’ve re-read it a few times that I realize that that word isn’t what was written at all. I’ve also experienced some short-term memory issues recently, as in the last couple years. For example, I’ll be working, and I’ll Alt-Tab to another open program to do something, and by the time the application has come into focus, I’ve forgotten what I was going to do with it. I swear that this happens at least a dozen times per day, and it’s very frustrating. I’m actually surprised that it hasn’t happened yet while I’ve been writing this post. Anyway, I just wanted to show off my awesome graphing skills and put up a post since it had been a while. That’s all.